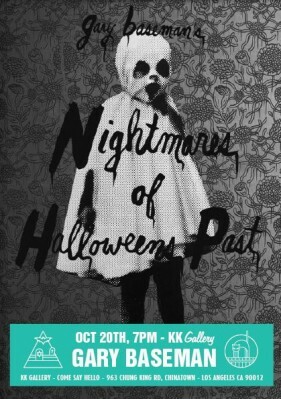 This Halloween, vintage hauntings and creepy DIY costumes come to KK Gallery! Gary Baseman opens up his vault and showcases for the first time a selection from his vintage Halloween photo collection dating back to 1915. Baseman’s collection of over 1500 photographs has been the inspiration for a series of haunting original paintings, special edition prints, installations and videos. This multi-media exhibit will celebrate not only Baseman’s favorite holiday, but the debut show of the newly founded KK Gallery on Chung King Road in Los Angeles’ Chinatown Arts District.